Is this a lemon? Is this a pine cone? Or is it a sculpture by Tony Cragg? The truth is I do not even know when my grandmother bought this glass decoration and I cannot ask her because she died twenty years ago. All I can do is hang it on my tree and admire it gleaming amongst the deep green boughs, along with all the others that were once hers, or were bought by my parents, or that I have acquired myself, which together form the collection I bring out each year – accepting that not knowing or not remembering their origins is part of their arcane charm. Although I have many that are more elaborate, I especially admire this golden one for its elegant simplicity of form and I like to think its chic ridged profile derives from the nineteen thirties when my mother was a child, because my grandmother took the art of Christmas decoration very seriously. She would be standing beech leaves in water laced with gelatine in October, pressing them under the carpet in November and then in December arranging the preserved leaves in copper jugs with teazles sprayed gold and branches of larch, as just one example of her fancy contrivances that she pursued each year to celebrate the season in fastidious style. Given the fragility of these glass ornaments, it is extraordinary that this particular decoration has survived, since every year there are a few casualties resulting in silvery shards among the needles under the tree. Recognising that a Christmas tree is a tremendous source of amusement for a cat – making great sport out of knocking the baubles to the ground and kicking them around like footballs – I hang the most cherished decorations upon the higher branches. Yet since it is in the natural course of things that some get broken every year, and as I should not wish to inhibit the curiosity of children wishing to handle them, I always buy a couple more each Christmas to preserve the equilibrium of my collection. 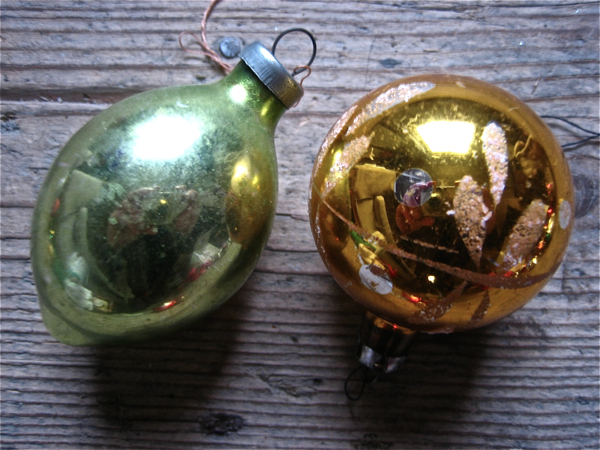 Of course, I am aware that everlasting baubles are available - they do not smash, they bounce – but this shatterproof technological advance entirely lacks the ephemeral poetry of these fragile beauties that can survive for generations as vessels of emotional memory and then be lost in a moment. 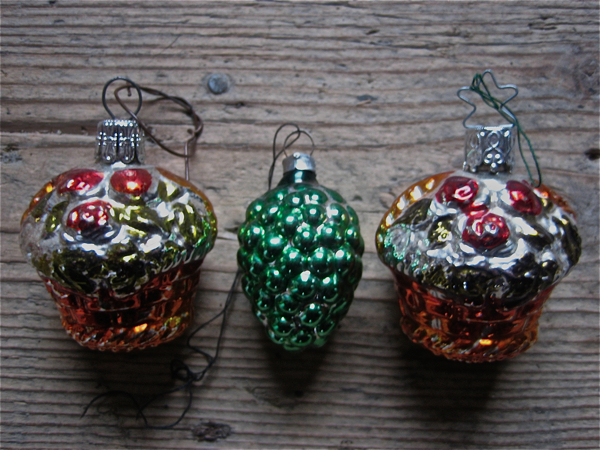 Much as we might wish it, life is not shatterproof, and in widespread recognition of this essential frailty of existence, there has been a welcome revival of glass ornaments in recent years. They owe their origins to the glassblowers of the Thuringian Forest on the border of Germany and the Czech Republic where, in Lauscha, glass beads, drinking glasses, flasks, bowls and even glass eyes were manufactured since the twelfth century. The town is favoured to lie in a wooded river valley, providing both the sand and timber required for making glass and in 1847 Hans Greiner – a descendant of his namesake Hans Greiner who set up the glassworks in 1597 with Christoph Muller – began producing ornaments by blowing glass into wooden moulds. 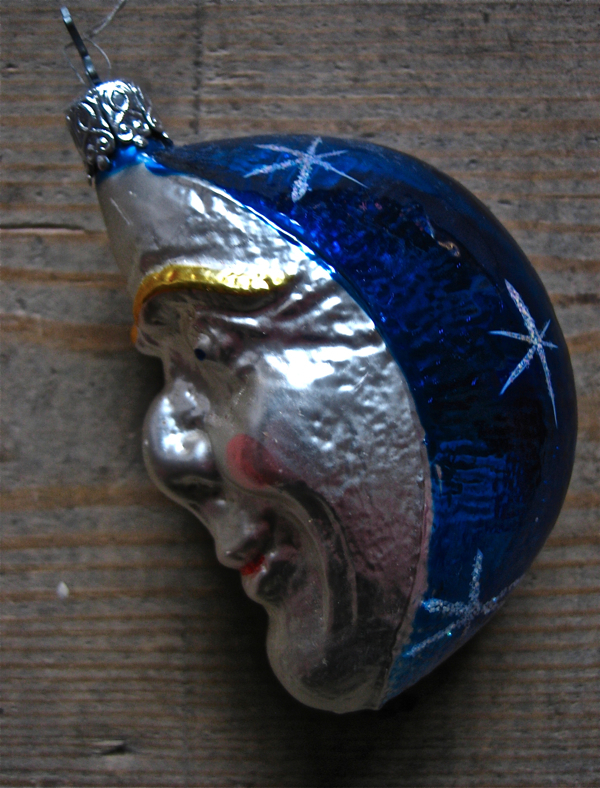 The inside of these ornaments was at first coloured to appear silvery with mercury or lead and then later by using a compound of silver nitrate and sugar water. 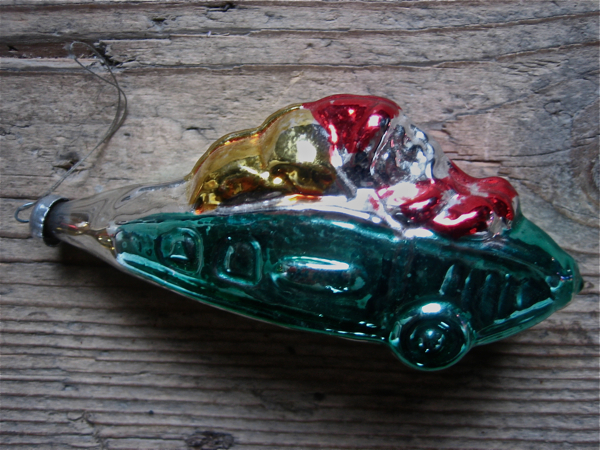 In 1863, when a gas supply became available to the town, glass could be blown thinner without bursting and by the eighteen seventies the factory at Lauscha was exporting tree ornaments throughout Europe and America, signing a deal with F.W.Woolworth in the eighteen eighties, after he discovered them on a trip to Germany. Bauble is a byword for the inconsequential, so I do not quite know why these small glass decorations inspire so much passion in my heart, keeping their romance even as other illusions have dissolved. Maybe it is because I collect images that resonate with me? 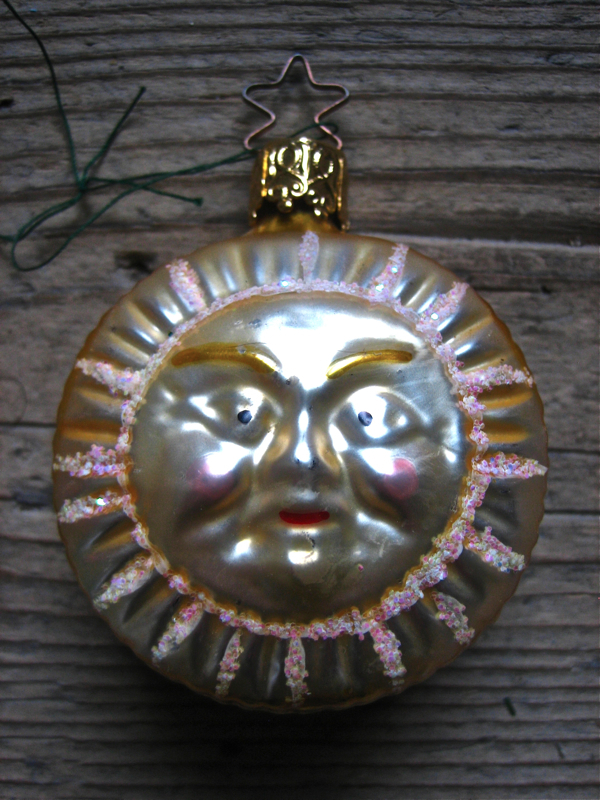 As well as Father Christmas and Snowmen, I have the Sun, Moon and Stars, Clocks and even a Demon to create a shining poem about Time, Mortality and Joy upon my Christmas tree. Let me admit, I cannot resist the allure of these exquisite glass sculptures in old-fashioned designs glinting at dusk amongst the dark needles of fir, because they still retain the power to evoke the rich unassailable magic of Christmas for me. 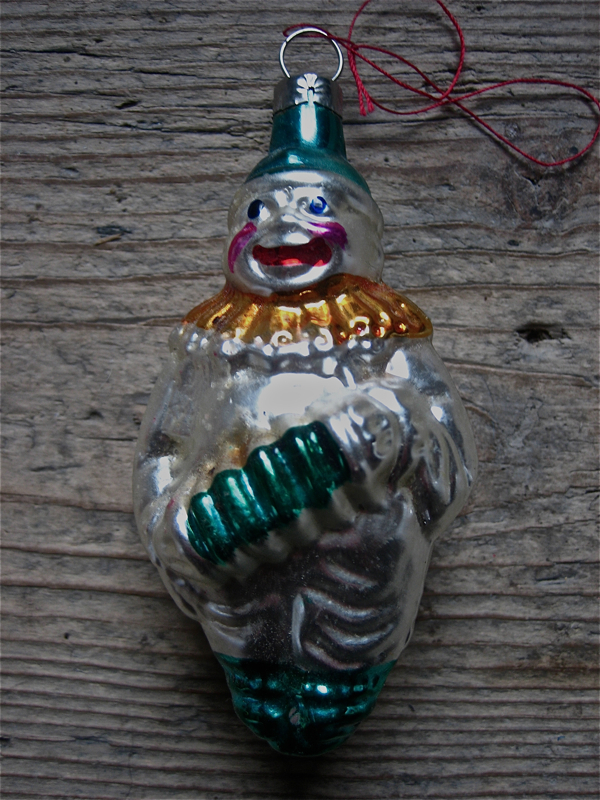 This pierrot dates from the nineteen eighties. Three of my grandmother’s decorations. The basket on the left has a piece of florists’ wire that she placed there in the nineteen fifties. 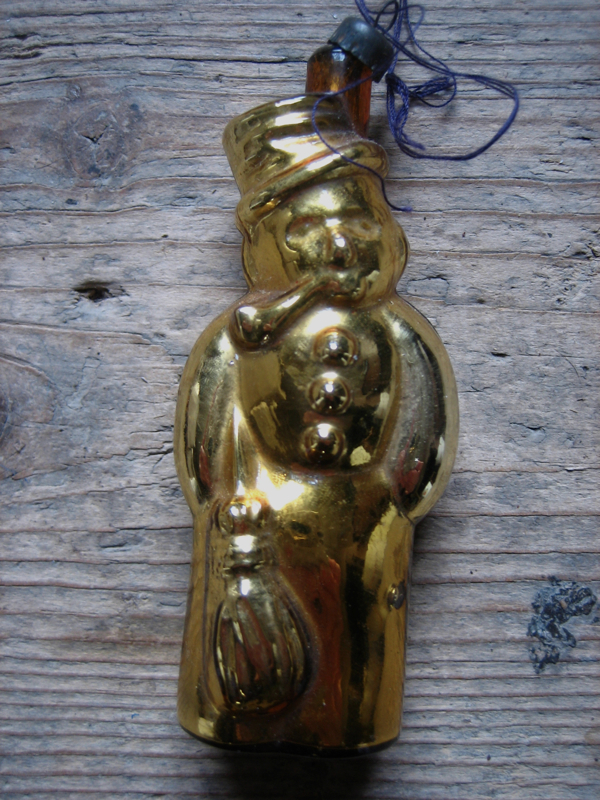 This snowman is one of the oldest of my grandmother’s collection. Bought in the nineteen eighties, but possibly from a much older mould. 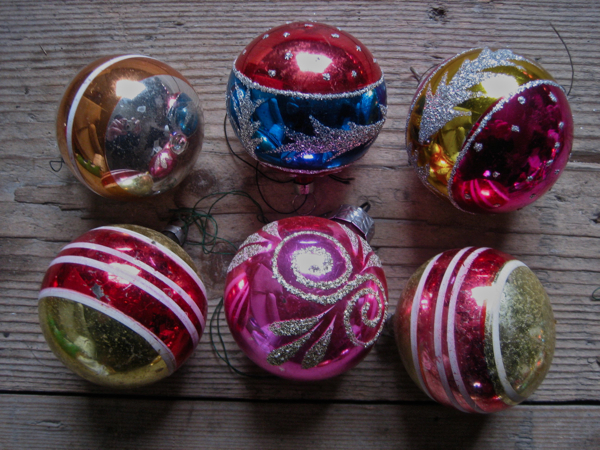 Baubles can be further enhanced with painted stripes and glitter. The moon, sun and stars were acquired from a shop in Greenwich Avenue on my first visit to New York in 1990, amazingly they survived the journey home intact. These two from my grandmother’s collection make a fine contrast of colour. 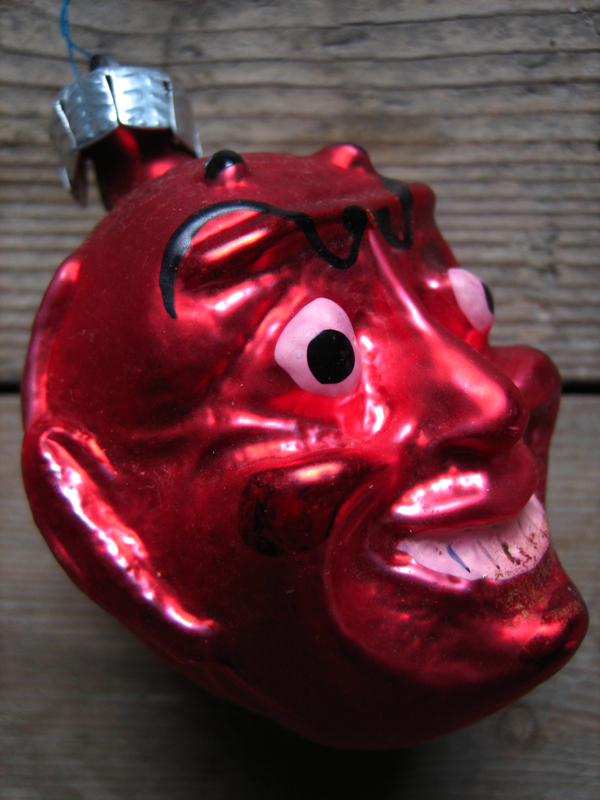 Even Christmas has its dark side, this demon usually hangs at the back of the tree. 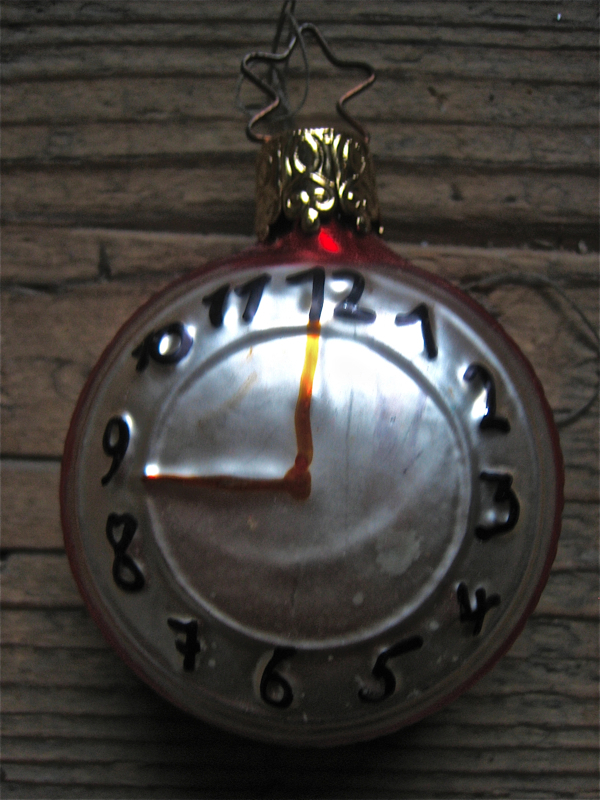 It is always going to be nine o’clock on Christmas Eve. 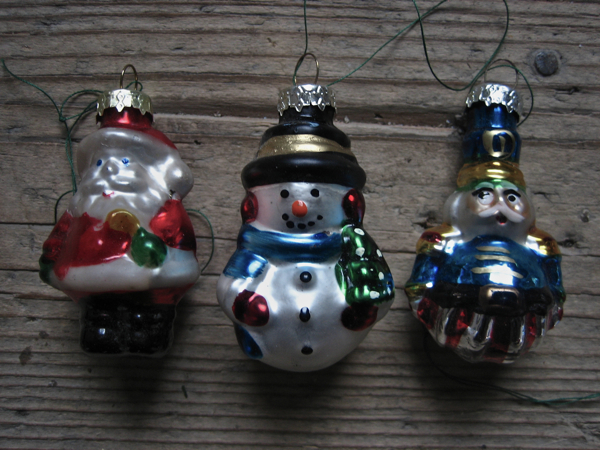 Three new decorations purchased at Columbia Rd last year. A stash of glittering beauties, stored like rare eggs in cardboard trays. 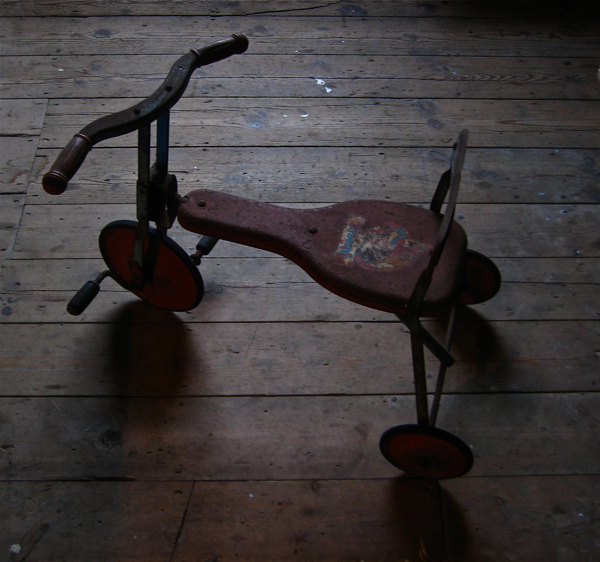 My first bicycle, that I found under the tree one Christmas and kept ever since. 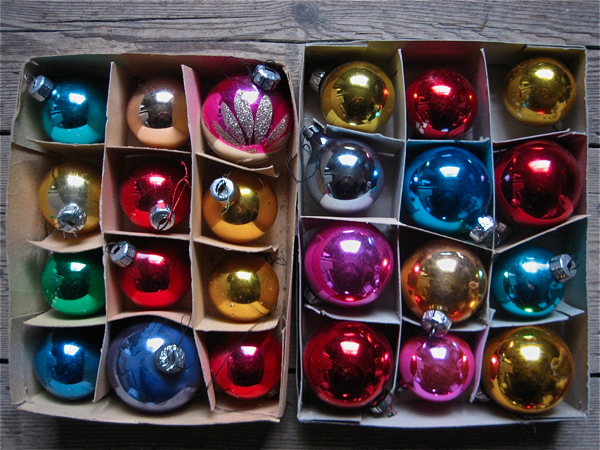 I collect antique Christmas ornaments too! I never knew there was anyone who loved them as much as I do. I appreciated the German origin information. Many of mine are from Germany and I too have the original boxes. What a delight they are. My collection began long ago in the southern USA when my father befriended an eccentric elderly lady (who only wore red) who showed me her collection. I was smitten. She ordered all sorts of things from Germany and Austria when most of our townsfolk couldn’t point to those far off places on a map! Thanks so much for another wonderful story. The most amazing glass ‘ornaments’ I have seen are the ones produced by the father and son Blaschka of various sea creatures. Some of them were on show at the Natural History Museum in their ‘Deep’ exhibition earlier this year and I know that the Grant Museum (due to reopen in the coming year) has some too. Gentle author, your Christmas posts once again have shown that you must be a really nice person to be around. That can be the only explanation for the number and variety of invitations that you get to share in other people’s lives. All best wishes for the year ahead. What a lovely collection of ornaments. I have a lot of glass beauties myself, but could not use them this year because we adopted two kittens and they were into the tree before we could even start decorating. Maybe next year, when they’re bigger, we’ll get the glass ones out. Wishing you a Happy New Year full of many blessings. 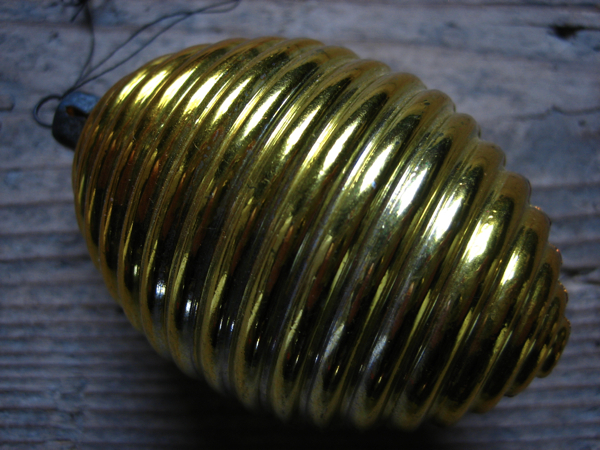 I opt for golden beehive as a description of your mystery ornament! But as you said, it’s the Christmas magic and the memories that matter, not their origins. Gentle author, loved the post about your ornaments. I visited my daughter before Christmas who lives deep in Herefordshire. Her tree hangs with old ornaments and also childish felt ones that she made when she was a child. She treasures them and it makes me glad. She also buys new ones and they are a delight to see. Long live those who adore Christmas of old. A happy New year Gentle Author , and thankyou for providing many a happy time reading your posts. Hi – I notice your last comment was several years ago but I’ll try anyway! What an interesting article, thank you! I have some glass baubles handed down from my mum – some are quite old – at least 60 years and maybe older. I love them, they are so pretty and irridescent and the paint is still intact on all of them. However a few have perished around where the hanging ring is – the glass has crumbled away. Do you know how I can repair them? I can still hang them all but I’m worried they might perish more and would like to stengthen them without spoiling them.